What is the Local Hospice Lottery? Would you like to be part of a lottery that helps us provide expert and compassionate hospice care to local people, whilst also giving you the chance to win a £2,000 prize every week? By becoming a regular player of the Local Hospice Lottery, you can do exactly that, for just £1 per week, per chance. We’re one of 20 hospices supported by Local Hospice Lottery. If you choose to support us, we’ll receive a share of the proceeds from each £1 you spend. As well as being in with a chance of winning £2,000 every week, there’s also a £1,000 prize which can roll over up to a maximum of £25,000, a £100 prize and 150 x £10 consolation prizes. As if all that wasn’t enough reason to join – you’ll also enter two Super Draws every year which have an additional guaranteed top prize of £10,000! Want to join? It's as easy as 1, 2, 3! 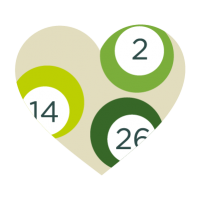 Signing up to be part of the Local Hospice Lottery couldn’t be simpler! Just head here to fill out your details and choose St Peter & St James Hospice as the charity you’d like to support. Prizes are issued automatically, so you don’t even need to worry about remembering to check your numbers or claim any prizes. However, results can be checked at www.localhospicelottery.org.